Last Thanksgiving, I was downtown when I was approached by a man named Chris. He was a veteran who had served our country in the armed forces but had experienced homelessness. He told me that the help and hard work by City of Chattanooga staff had made it possible for him to move into an apartment only a few days before, allowing him to spend Thanksgiving in a place of his own for the first time in years. I wish I could say Chris’ homelessness was an isolated story. Unfortunately, a lot of recent data suggests that Chattanooga’s homeless population is growing. While so much of Chattanooga is prospering, with employment, wages, and population on the rise, we cannot turn a blind eye to those who are not benefiting from this growth — and who in fact may be finding it harder and harder to get ahead. 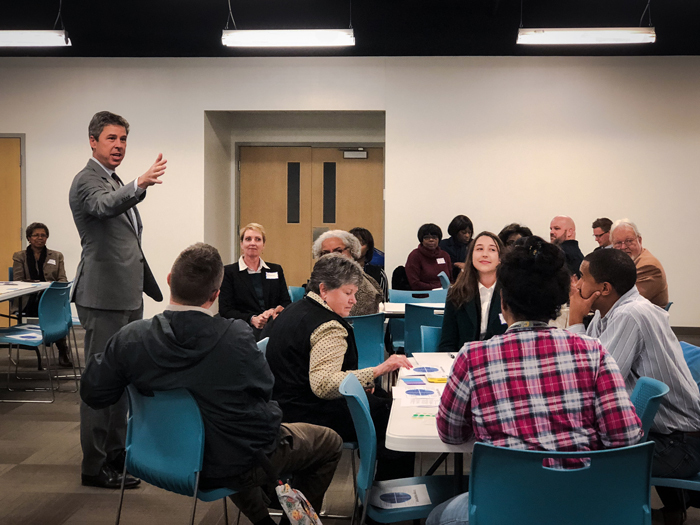 That’s why I created the Chattanooga Interagency Council on Homelessness earlier this year, and why I’m very pleased to announce their new Homeless Action Plan. This plan will build on our efforts to find stable, supportive housing for veterans, as well as the hard work of many local nonprofit agencies and community partners. At the core of this plan is a commitment to getting people into housing and supporting them when they get there. We cannot help people address the factors that caused them to be homeless until and unless they are in a home. We know that this approach has a long-term success rate of around 85%. That means between 8 and 9 of every 10 people we can move into housing will remain there. Continuing our housing-first strategy, building on the model we used to end Veteran Homelessness – outreach, housing navigation, and resources for housing subsidies and supportive case management. We need to use a Rapid Rehousing model for non-chronically homeless and a Permanent Supportive Housing model for those who are chronically homeless. Working with landlords and developers, building non-traditional partnerships, and aligning resources to expand the availability of affordable housing for homeless individuals. I invite you to take a look at the full draft Action Plan here. There are a few things you can do right now to help: Donate to Family Promise and we’ll use your contributions to provide temporary shelter to veterans. Join us for a training to hear how to engage with individuals experiencing homelessness. Sign up for the CICH newsletter to stay up to date on the plan and implementation. As we begin the process of creating our Fiscal Year 2020 budget, we want to hear from Chattanoogans. Direct input from people in our community on what you want the city to fund for the upcoming year will help us make a better, more efficient, and more effective budget. Please click here to give us your feedback via a short online survey. This survey will be open until 4:30 p.m. on Monday, December 10.